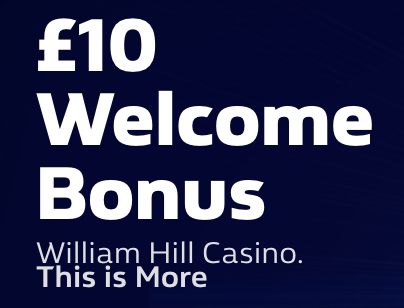 Get a £10 No Deposit Welcome Bonus at William Hill – Play for Free! William Hill is one of the most well-known bookies and casinos in all the UK. They offer sports betting, as well as Casino, Live Casino, Scratchcards, Bingo, and Poker. They have an excellent selection that should please casino punters as well as sports aficionados. As one of the biggest gambling sites in the UK and even the world, you can count on a level of professionalism and a variety that you might not find at smaller gambling sites. On top of their regular welcome offers and promotions for Casino and Sports, you can now get a £10 No Deposit Welcome Bonus, thanks to FreeSpinsNoDepositUK. You can thank us later! William Hill is best known for being a sportsbook. They sponsor all sorts of sporting events and teams, including Chelsea, Everton, and Tottenham. Málaga CF, the South Stand at Hampden, the World Darts Championship, the Ayr Gold Cup, Great St. Wilfrid, the William Hill, and Scottish Sprint Cup. Most sports punters know of the brand, and it is one of the biggest sites in the UK. They offer odds on any sport and league you can imagine, as well as live betting, multiples, outrights and more. They have several promotions going on all the time, but their main welcome offer for sports is pretty sweet: £30 of Free Bets! Sign up, make a deposit of £10 and place a wager. Whether you win or not, you will get 3 Free Bets of £10 each! That is on top of our exclusive No Deposit offer of course! William Hill may be most famous for their sportsbook, but having a look at their casino might make you think this is their main priority. The casino has thousands of slots, as well as a live casino, scratch cards, and bingo. You can even choose between different landing pages for the casino, such as Vegas or Macau, each with their own game selection. The casino is complete with its own set of fun promos. There is also a welcome offer, just for casino players: 100% Bonus up to £300. Sign up, deposit £10 or more and your deposit will be doubled up to £300! The exclusive £10 welcome bonus visitors of FreeSpinsNoDepositUK can get is for the live casino, slots, and games. Simply visit William Hill from this page and sign up for an account on the casino page. You will get a free £10 for your efforts. You can use this bonus any way you like for the casino. Make one large bet, or many smaller ones. Bet on slots, scratch card, table games or the live casino. Wagering is 35x.